How Safe Is Saccharin and Is It Okay to Consume? All in all, the no-calorie sweeteners are safe, otherwise, they wouldn't be approved for use. But, the use of artificial sweeteners is controversial for some people, even though they all appear safe and have been part of many peoples' diets for decades. One of the oldest no-calorie sweeteners is saccharin, and it has an interesting history, including false cancer scare. Saccharin was discovered in 1879 and was used early in the 20th century as a sugar replacement for people with diabetes. Saccharin isn't as popular as it once was, but it's still available as a powdered sweetener. The reason saccharin is so low in calories is that it's 200 to 700 times sweeter than table sugar, so very little is needed. Saccharin has a long history of safe use by humans. But, some research lab studies published back in the 1970s indicated that large amounts of saccharin caused bladder tumors in male rats. Those findings led to a Food and Drug Administration decision to ban the sweetener, but instead, the United States Congress passed legislation requiring the following warning label to be prominently placed on any foods that contain saccharin. "Use of this product may be hazardous to your health. This product contains saccharin which has been determined to cause cancer in laboratory animals." Researchers wanted to learn more about how saccharin might cause cancer. But when they dug deeper, they found the mechanism responsible for bladder tumor formation in the male rats was not about human biology — the male rats synthesize a certain protein that's not found in the human body. Since there was no reason to believe saccharin would cause cancer in people, it was removed from the list of substances that cause cancer in humans, and the law requiring the warning label was repealed. Products sold in the United States that contain saccharin are no longer required to carry warning labels. Saccharin may have been exonerated as a cancer-causing agent, but it's not used too often today — mostly because newer sweeteners like aspartame and Sucralose don't have the strong bitter aftertaste. Sweet'N Low powder is available in most grocery stores, and it's found as an ingredient in a few foods. A diet soda called TaB is still sweetened with saccharin, but it also contains aspartame. Academy of Nutrition and Dietetics. "Position of the Academy of Nutrition and Dietetics: Use of Nutritive and Nonnutritive Sweeteners." J Am Diet Assoc. 2004 Feb;104(2):255-75. http://www.andjrnl.org/article/S2212-2672(12)00325-5/abstract. The National Cancer Institute. 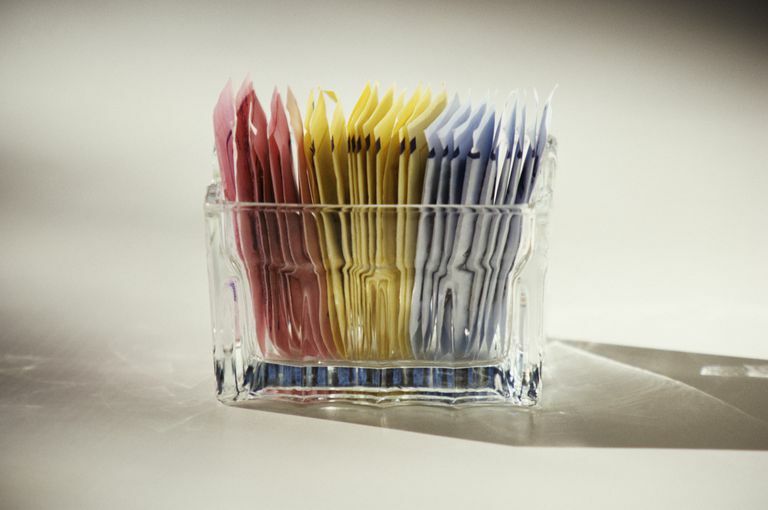 "Artificial Sweeteners and Cancer: Questions and Answers." http://www.cancer.gov/cancertopics/factsheet/Risk/artificial-sweeteners. The United States Food and Drug Administration. "Artificial Sweeteners: No Calories ... Sweet!" http://www.ncbi.nlm.nih.gov/pubmed/17243285. The Truth Behind Your Foodborne Illness Risk: How Safe Is Your Food? What Is Calcium Propionate and Is It Safe to Eat? Are Weight Gain Pills Safe and Effective? Is Sodium Benzoate Safe to Consume? Should a Person with Diabetes Use Artificial Sweeteners? Which Types and Brands of Mustard Are Gluten-Free? Can You Eat Baked Goods Made With Spelt on a Gluten-Free Diet?